Notes on Foldable, Traversable and other useful classes or "Where is Data.Sequence.toList?" Data.Sequence is recommended as an efficient alternative to [list]s, with a more symmetric feel and better complexity on various operations. The Sequence version of map is "fmap", which comes from the Functor class. The Sequence version of toList is in the Foldable class. When working with Sequence you also want to refer to the documentation for at least Foldable and Traversable. 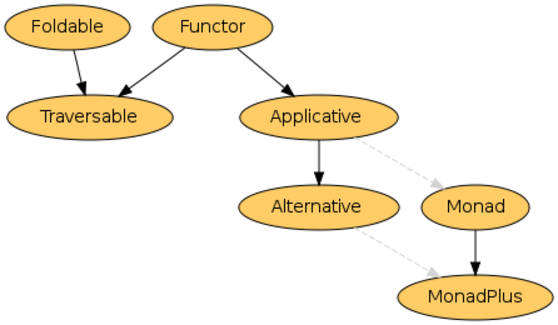 Functor only has the single method, so we've already covered that. A functor is simply a container. Given a container, and a function which works on the elements, we can apply that function to each element. For lists, the familiar "map" does exactly this. Note that the function can produce elements of a different type, so we may have a different type at the end. A Foldable type is also a container. The class does not require Functor superclass in order to allow containers like Set or StorableVector that have additional constraints on the element type. But many interesting Foldables are also Functors. A foldable container is a container with the added property that its items can be 'folded' to a summary value. In other words, it is a type which supports "foldr". Once you support foldr, of course, it can be turned into a list, by using toList = foldr (:) . This means that all Foldables have a representation as a list, but the order of the items may or may not have any particular significance. However, if a Foldable is also a Functor, parametricity and the Functor law guarantee that toList and fmap commute. Further, in the case of Data.Sequence, there is a well defined order and it is exposed as expected by toList. A particular kind of fold well-used by Haskell programmers is mapM_, which is a kind of fold over (>>), and Foldable provides this along with the related sequence_. A Traversable type is a kind of upgraded Foldable. Where Foldable gives you the ability to go through the structure processing the elements (foldr) but throwing away the shape, Traversable allows you to do that whilst preserving the shape and, e.g., putting new values in. Traversable is what we need for mapM and sequence : note the apparently surprising fact that the "_" versions are in a different typeclass. Neither Traversable nor Foldable contain elements for concatMap and filter. That is because Foldable is about tearing down the structure completely, while Traversable is about preserving the structure exactly as-is. On the other hand concatMap tries to 'squeeze more elements in' at a place and filter tries to cut them out. And that works with lists and sequences both. Does it work with any Monoid which is Foldable? Only if the Monoid 'means the right thing'. If you have toList (f `mappend` g) = toList f ++ toList g then it definitely makes sense. In fact this easy to write condition is stronger than needed; it would be good enough if they were permutations of each other. It's interesting to note that, under these conditions, we have a candidate to help us turn the Foldable into a Monad, since concatMap is a good definition for >>=, and we can use pure for return. The code above fails with a pattern match error when the Foldable container doesn't have enough input. Here is an alternative version which provides friendlier error reports and makes use of State instead of the self defined Supply monad. -> error $ n ++ ": insufficient input"
This page was last modified on 12 January 2013, at 10:16.